DRIVE AXLE - 7.125", 7.56" (7 9/16") & 8.25"
Charging system consists of a Powertrain Control Module (PCM), alternator, CHECK ENGINE light and battery. Voltage regulation is controlled within the PCM and cannot be serviced. The PCM monitors charging system input and output to ensure correct operation. The PCM stores any charging system failures in memory and outputs fault code(s) when on-board diagnostics are entered. The PCM monitors several different engine control system circuits. If a problem is detected within a monitored circuit, a fault code is stored in the PCM memory. The CHECK ENGINE light will illuminate and system may enter limp-in mode. In limp-in mode, engine controller compensates for component or circuit failure by using information from other sources until repairs are made. NOTE: Fault codes remain in memory for 50 engine starts. Fault is erased from memory if failure does not reoccur. (1) - Tension in lbs. (kg) using belt tension gauge. Visually inspect wiring and drive belts. If charging system is not working, ensure drive belts are properly tightened. Ensure 12 volts exist at alternator field terminal with ignition on. Ensure battery cables, alternator ground cables and alternator and terminal block connections are clean and tight. Ensure alternator field circuit is not grounded (overcharging). Check for loose alternator belt, defective alternator, loose alternator ground wire or corroded battery terminals. 18 volts) to vehicle’s charging system. See Fig. 1. Connect a carbon pile rheostat between battery terminals. Ensure carbon pile is in OFF position before connecting leads. CAUTION: Alternator has 2 field terminals. In step 3), DO NOT connect jumper wire to alternator field terminal Dark Green/Orange wire. alternator field terminal Dark Green wire on rear side of alternator. See Fig. 2. Connect negative battery cable. voltmeter reading. Voltage drop should be .5 volt or less. is complete. Remove all test equipment. Fig. 1: Testing Alternator Output Wire Resistance (Typical) Courtesy of Chrysler Corp.
negative battery cable. Connect a 0-150 DC ammeter and a voltmeter (0-18 volts) to vehicle charging system. See Fig. 3. 2) Connect a carbon pile rheostat between battery terminals. Fig. 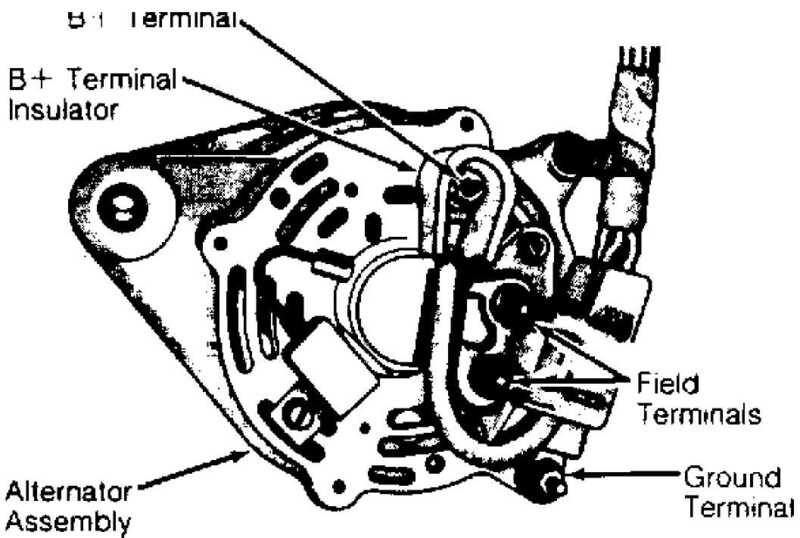 2: Identifying Alternator Terminals Courtesy of Chrysler Corp.
alternator. Remove all test equipment. Fig. 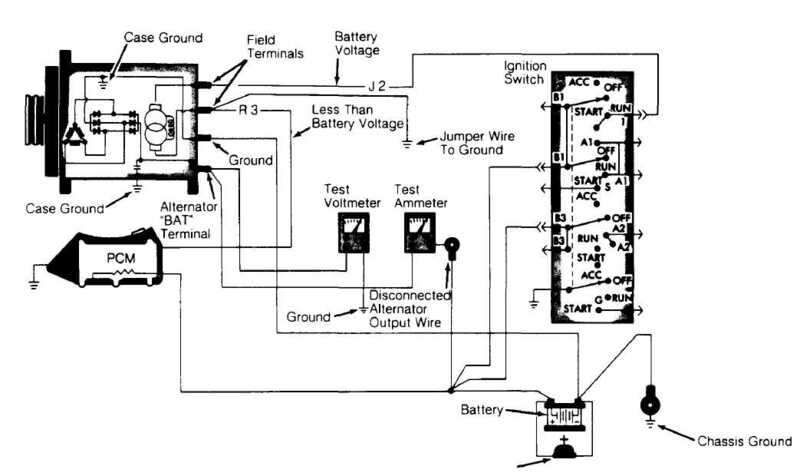 3: Testing Alternator Current Output (Typical) Courtesy of Chrysler Corp. CAUTION: Before entering on-board diagnostics, check charging system for other problems. See PRELIMINARY CHECKS under TROUBLE SHOOTING. DO NOT connect DRB-II to vehicle with battery charger connected. Damage to DRB-II may result. Trouble codes may be read by using the CHECK ENGINE light on instrument panel or using DRB-II. See CHECK ENGINE LIGHT DIAGNOSTIC MODE and DIAGNOSIS USING DRB-II headings below. A more complete diagnosis is possible using DRB-II. NOTE: The PCM CANNOT diagnose every charging system problem. If a fault still exists after performing self-diagnostic procedures, go to TESTING (ON-VEHICLE). switch properly. PCM monitors this circuit whenever ignition is on. memory. PCM monitors this signal whenever engine is running. - This code will cause limp-in mode. - Sensor inside PCM. If failed, replace PCM. NOTE: Only charging system-related codes are listed here. For engine-related codes, see appropriate G - TESTS W/CODES article in the ENGINE PERFORMANCE Section. A/C switch on and then off (if equipped). as displayed by flashing CHECK ENGINE light. trouble code number to a system fault description (DRB-II display). Once trouble area is known, go to appropriate charging system test. NOTE: CHECK ENGINE light cannot be used to perform actuation test mode, sensor test modes or engine running test. Fault codes can only be erased using DRB-II. Fault codes will be erased from PCM memory after 50 engine starts if fault does not occur again. The DRB-II is used as part of the charging system diagnostic procedure. Perform TEST CH-1, BATTERY CONDITION CHECK and also the CHARGING VERIFICATION (CH-VER) test. TO ERASE). Press ENTER key. NOTE: DO NOT touch DRB-II keypad during DRB-II power-up sequence, or an error message will result. compartment, near PCM. Turn ignition switch to RUN position. information will appear on screen for several seconds. 5) After several seconds AIR COND menu will appear. Press "1"
ENGINE SYSTEMS menu. At ENGINE SYSTEMS menu, press "2" (CHARGING) key. Press ENTER key. This allows technician to read and erase fault codes. Fault counter will appear along with fault displayed on DRB-II. For example, DRB-II will display 1 OF 2 FAULTS. PCM will store up to 8 fault messages. Faults are numbered in reverse order of setting. Most recent fault to occur will be number one. Vehicles without A/C will always have A/C CLUTCH RELAY CKT (circuit) stored in memory. This fault will always be number one if vehicle is not equipped with A/C. If no fault messages are stored, DRB-II will display NO FAULTS DETECTED and start counter will show 0 STARTS SINCE ERS. A start counter will appear below DRB-II fault counter display. Start counter counts the number of times vehicle is started since faults were last set, erased or battery was disconnected. This helps determine if fault is intermittent. Memory space limits start counter to first 3 faults. Start counter of zero equals a hard fault. Start counter of more than zero indicates an intermittent fault. Start counter will count up to 255 starts. If no fault messages are stored, DRB-II will display NO FAULTS DETECTED and start counter will show 0 STARTS SINCE ERS. This allows technician to read status or values of sensors, inputs/outputs and components. PCM can only recognize high and low status on switch circuits. PCM cannot detect the difference between an open or short circuit or a defective switch. If DRB-II displays a change between INPUT HIGH and INPUT LOW, it can be assumed that entire switch circuit to PCM is working. This function allows the technician to check operation of output circuits or devices, which PCM cannot detect. DRB-II allows PCM to activate these outputs or devices. so technician can check for proper operation. Most tests available in this mode provide an audible or visual indication of device operation (click of relay contacts, fuel spray, etc.). With exception of an intermittent condition, if a device functions properly during its test, it, its wiring and its driver circuit are presumably working properly. This function allows user to erase fault codes. Function also allows user to reset Emission Maintenance Reminder (EMR) light and mileage. volt/ohmmeter test lead to Red port, located on right-top side of DRB-II . connector, only one volt/ohmmeter test is required when using volt/ohmmeter option. To access voltmeter, press VOLT/OHM key once. DRB-II is now in voltmeter mode. Touch test probe to connector or wire to be measured. Read voltage on DRB-II display. When voltage testing is complete, press VOLT/OHM key 3 times to exit voltmeter mode. To access ohmmeter, press VOLT/OHM key t,vice. DRB-II is now in ohmmeter mode. Touch test probe to connector or wire to be measured. Read resistance to circuit ground on DRB-II display. When resistance testing is complete, press VOLT/OHM key twice to exit ohmmeter mode. Press VOLT/OHM key 3 times. Display will read NO CONTINUITY. Touch test probe to connector or wire to be measured. Read continuity on DRB-II display. When continuity testing is complete, press VOLT/OHM key once to exit continuity meter mode. Mode is used to show what vehicles are covered by DRB-II cartridge. To access VEHICLES TESTED mode, turn ignition off. Attach DRB-II to engine diagnostic connector. Connector is located in engine compartment, near PCM. Turn ignition switch to RUN position. All DRB-II character positions will glow and copyright information will appear on screen for several seconds. After several seconds DRB-II menu will appear. At DRB-II menu, press VEHICLES TESTED) key. Press ENTER key. DRB-II will display vehicles covered by cartridge. Screen will display for 5 seconds and return to DRB-II menu. Enter DRB-II menu display. Refer to VEHICLES TESTED MODE. At DRB-II menu, press 2 (HOW TO USE) key. Press ENTER key. A series of screens will be displayed explaining use of DRB-II keys used to move through engine diagnostic program. proceeding. If battery shows signs of freezing or leakage, battery posts are loose or battery has low electrolyte level, DO NOT test. color, charge battery and go to next step. test. If voltage reading is okay, go to next step. speed to 2000 RPM for 30 seconds. Turn ignition off. Connect DRB-II. Turn ignition on with engine off. Read faults. 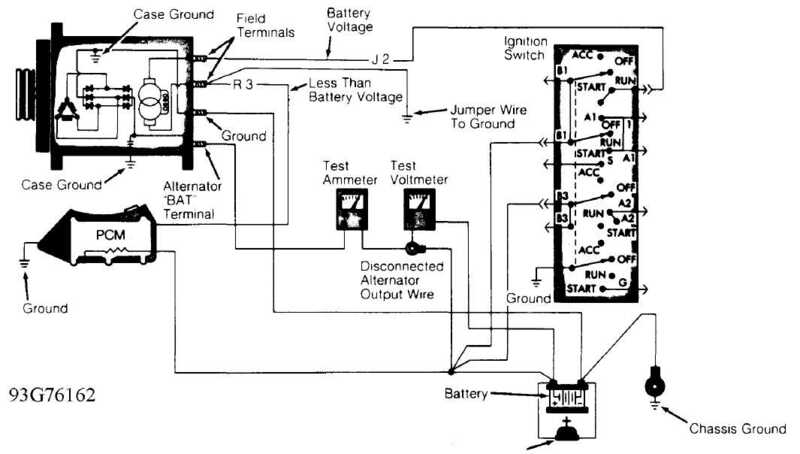 replace PCM and perform CHARGING VERIFICATION (CH-VER) test. If DRB-II displays other messages, go to appropriate test. If DRB-II does not display any faults, neither fault messages nor faults are intermittent. Go to TEST CH-5, CHECKING FOR INTERMITTENT PROBLEMS. NOTE: Perform TEST CH-1, BATTERY CONDITION CHECK before proceeding. ignition switch. If voltage is 10 volts or greater. go to next step. probing Dark Green wire at back of alternator. If voltage is less than 10 volts, go to next step. If voltage is 10 volts or greater, go to step 6). Turn ignition off. Disconnect and inspect PCM connector. is less than 5.0 ohms, go to next step. resistance is less than 5.0 ohms, replace PCM. ohmmeter, check for resistance in field driver circuit alternator harness terminal and cavity No. 20 on PCM connector. See Fig. 4. If resistance is 5.0 ohms or greater, repair short to ground in field driver circuit (Dark Green wire). If resistance is less than 5.0 ohms, replace PCM. Perform CHARGING VERIFICATION (CH-VER) test. Fig. 4: Identifying PCM Connector Cavities Courtesy of Chrysler Corp. Perform TEST CH-1, BATTERY CONDITION CHECK before proceeding. 1)1f alternator voltage is 15.1 volts or greater, replace PCM. If less than 15.1 volts, ensure no resistance is present between alternator BAT (B+) and battery positive terminal. CAUTION: Ensure all wires are clear of moving engine parts. 2) Check alternator case for good continuity to ground and negative battery cable. If continuity is good, manually set engine speed to 1600 RPM. Compare voltage on DRB-II and voltage on an external meter. If voltage difference is one volt or greater, replace the alternator. If the difference is less than one volt, proceed to TEST CH-5, CHECKING FOR INTERMITTENT PROBLEMS. to step 4).1f voltage is less than 10.0 volts, turn ignition off. Disconnect PCM connector, inspect and repair if necessary. step 6). If voltage is less than 10.0 volts, go to next step. alternator harness. If resistance is less than 10.0 ohms, repair Dark Green wire for short to ground. If resistance is 10.0 ohms or greater, replace alternator. Perform CHARGING VERIFICATION (CH-VER) test. 4) With ignition on and engine off, read voltage. If less than 13.0 volts, replace PCM. Perform CHARGING VERIFICATION (CH-VER) test. If voltage is 13.0 volts or greater, start engine and read voltage. Compare voltage readings before and after engine is running. Watch for a one-volt difference, waiting up to 5 minutes,. 5)1f voltage difference is one volt or greater, replace PCM. Perform CHARGING VERIFICATION (CH-VER) test. If difference is less than one volt, go to TEST CH-5, CHECKING FOR INTERMITTENT PROBLEMS. connector. Disconnect alternator harness from back of alternator. With DRB-II in ohmmeter mode, check resistance between field driver circuit alternator harness terminal and cavity No. 20 on PCM connector. If resistance is 5.0 ohms or greater, repair short to ground in field driver circuit (Dark Green wire). If resistance is less than 5.0 ohms, go to next step. 5.0 ohms, Replace PCM. Perform CHARGING VERIFICATION (CH-VER) test. NOTE: Perform TEST CH-4, CHARGING SYSTEM VOLTAGE HIGH (CODE 46) before proceeding. Actuate alternator field. Put DRB-II in voltmeter mode. zero to battery voltage every 1.4 seconds. cycle, test is complete. Perform CHARGING VERIFICATION (CH-VER) test. PCM. Connect DRB-II to engine diagnostic connector. and erase faults. Recheck system for fault codes. 1f fault codes reset, charging system still needs repair. TEST CH-1, BATTERY CONDITION CHECK. NOTE: Alternators are not serviceable. Replace, if defective. Overhaul information is not available.